Ambily Adithyan is a trained environmental and social impact specialist, passionate about driving systems level change to create real social value. She is the founder and curator of Rethinking Social, a platform for impact business enthusiasts to understand and use business principles to deliver a social mission. She develops business case studies, with a focus on social entrepreneurship, for use by management students. 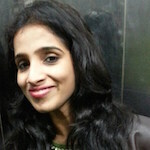 Ambily completed her masters in Environmental Engineering and Management from Indian Institute of Technology, Kanpur, and subsequently worked as an environmental and social consultant with AECOM India where she conducted impact assessment studies for various national and international bodies including financial institutions like World Bank and Asian Development Bank (ADB). Organisations, networks and government should foster a culture of ongoing interactions with people from other sectors and collaborate to develop new structures and business models that can be replicated. The commitment demands time and extended effort. But for those with an appetite to buy into the risk, there is a tremendous potential for social ventures to scale and create a massive impact.